Our weather overall has been good this winter. Although a bit more wind than I care for. I have been having fun meeting people introducing the Wavewalk to them and find it a very versatile platform. I am working on some modifications for my own use and will pass them on if successful. I started working with a vet group “Heroes on the Water” we take disabled vets fishing. This chapter is growing and continuing to get organized. We are lucky with all the diversity of the Indian River and Lagoon. The places we have fished so far is a bit more open water. Here’s a picture showing my mode of transportation. Slides on easily from the rear and actually rides well on the highway. 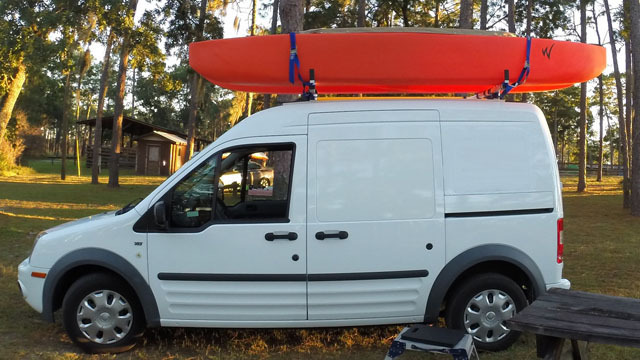 The way you attach the kayak to the car rack is the simplest, and it’s also most effective. What a great service you are doing for our Vets. Hero’s on the water sounds like a wonderful program.